The Royal Gun-carriage, or Rajarot Puen Yai / Rajarot Rang Puen, is used in the royal cremation of a king or a high-ranking royal who held a military position. It is an important royal chariot to be used to carry the Royal Urn on three counter-clockwise rounds of the Royal Crematorium. The use of this chariot was introduced in the reign of King Vajiravudh (Rama VI), to replace the traditional use of Phra Yannamas Sam Lam Khan (Palanquin with Three Poles). In response to the wishes of King Vajiravudh, King Prajadhipok (Rama VII) ordered the use of the Rajarot Puen Yai to carry the Royal Urn for King Vajiravudh on three counter-clockwise rounds of the Royal Crematorium. Rajarot Puen Yai was used for the last time in the Royal Cremation of King Ananda Mahidol (Rama VIII) in 1950. 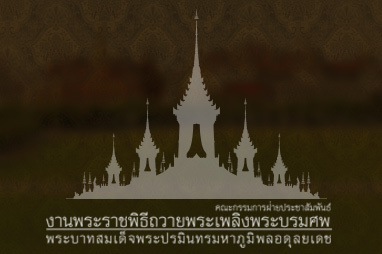 Again, it will be used in the Royal Cremation Ceremony for His Majesty King Bhumibol Adulyadej.